The Marketing and Communications team at Algoma University serves to enhance and strengthen the reputation of the University in the minds of our various constituent groups. Among other things, we are responsible for the University’s online presence, including websites and social media, print publications, media relations, public relations, marketing and advertising. We’re pleased to share with you this abbreviated online edition of our Brand Standards Manual for Algoma University. The consistent implementation of these standards will distinguish our brand in the marketplace, strengthen our identity and help to achieve our overall growth strategy for the future. Brand recognition creates trust and instills confidence. Our goal is for all materials produced by and for Algoma University to be readily identified as such and represent what we stand for. Our University messaging, brand signature, stationery, brochures and printed items, signage, promotional material, forms, vehicles and advertising must project the same clear, consistent identity and personality. Standards outlined in this manual set the benchmark for our strengthened positioning, and provide you with the tools you need to present Algoma in a clear, competitive and differentiating manner. Guidelines for successful use of these fundamental elements follow, with a wide range of applications and supporting material. If you require our assistance, we can be reached at communications@algomau.ca. Our wordmark expresses our personality and encapsulates our identity with impact. And it makes Algoma instantly and easily recognizable. The wordmark should always be taken from an electronic master reproduction file. Don’t copy or scan the brand signature from any other material. Use the official versions of the brand signature only. The elements within the signature and their relative position to one another cannot be changed under any circumstances. Think of the wordmark as a picture that shouldn’t be retouched or reconfigured in any way. For any questions on the use of the Algoma wordmark, please contact the University Marketing and Communications team at: communications@algomau.ca. Usage Note: We have provided different versions of each element of the Algoma University visual identity, as digital files for use. It is important to understand which file should be used in what application. For convenience, we provide a quick summary, but encourage users to check with the Marketing and Communications team if you have any questions. Print: Always use either the .ai or .eps version for print. These files will require special software (ie. Adobe Illustrator) to open. For your convenience, we have also provided a PDF, which should only be used to view the file. Online: We have provided small, medium, and large .jpg versions of each file. Please use the appropriate sized file for maximum efficiency. NEVER ENLARGE A .JPG FILE. If you require a larger .jpg version, please contact Marketing and Communications. Special Applications: If your supplier is asking for something other than .ai, .eps, or .jpg versions, it’s best to put them in touch with the Marketing and Communications team. The wordmark is available in different formats for a variety of uses. The preferred usage is red and grey on a white background. Use this wordmark for all print advertising, collateral, stationery and web applications. In some cases the use of solid red on our materials will require that the wordmark be reproduced on a red background. 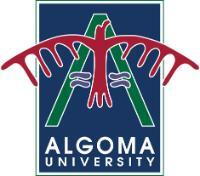 In this “knocked out” version, the red type in the word “Algoma” becomes white, while the grey in “university” remains in grey, albeit a slightly different shade in order to provide contrast. ‌The Algoma University symbol, adopted in 1972, is a stylized Thunderbird. It was developed by Mrs. Dora de Pedery-Hunt, the well-known Canadian sculptor, from Indian pictographs in the Agawa Bay area. The Thunderbird remains the primary icon representing Algoma University. They “new” Thunderbird has been updated in order to make the icon stronger and more consistent. This “new” Thunderbird is a symbol of strength for the University, embodying the hope and aspirations of our students. The Thunderbird should most often be shown in red on a white background. In some cases the use of solid red on our materials will require that the Thunderbird be reproduced on a red background. In this “knocked out” version, the icon should appear in white. The official brand colour for Algoma is Pantone 1805, a colour that’s been selected to create confidence and consistency for the University. It’s vivid and strong and will stand out. The grey, Pantone Cool Gray 9, is the official colour that acts as a complement to the red. It is used in the word UNIVERSITY in the primary wordmark. When the wordmark is reversed on a red background, the word UNIVERSITY should be presented in Pantone Cool Gray 4. To ensure consistent colour reproduction using Pantone colours (coated and uncoated), four-colour process, or RGB, these specifications must be followed. In 1996, alumnus Jane Scott Barsanti created the existing crest, incorporating the Thunderbird into the design. In the crest, ‘A’ stands for Algoma, and is indicative of learning and achievement; it also suggests the shape of a teaching wigwam, which is the foundation of Algoma’s educational philosophy today. Other circumstances may warrant using this mark. Permission for use other than listed above may be requested from the University Marketing and Communications team. In 1981 our Thunderbird was made into a flag for the occasion of a healing and reconciliation memorial and ceremony conducted after the first Shingwauk Reunion, which honoured the two branches of Founders of education on the site, traditional and contemporary, Native and non-Native; Shingwauk and Algoma. The Thunderbird Flag was made by Algoma Student and Student Council member Pam Forster, and presented by her and Rolland Nadjiwon, Founding Executive Director of the Keewatinung Institute, to Dr. Dennis Howell, Chairman of the AUC Board of Trustees, and Shingwauk Alumnus and Garden River Elder, Daniel Erskine Pine Sr. It was blessed by the Bishop Frank Nock of the Anglican Diocese of Algoma and raised by him and Dr. Howell at an Honour Ceremony and Song for the Flag by a local Native Drum Group. The Flag has been flown since as the symbol/dodem of then Algoma University College, now Algoma University. The Thunderbird flag flies proudly in front of the front entrance to Shingwauk Hall. Although the Thunderbird as a symbol of Algoma University may evolve over time, the flag will remain as it was presented in 1981.